In this YouTube video, a mischievous little parrot thinks he's being sneaky, but the prankster is hilariously transparent about his next move. 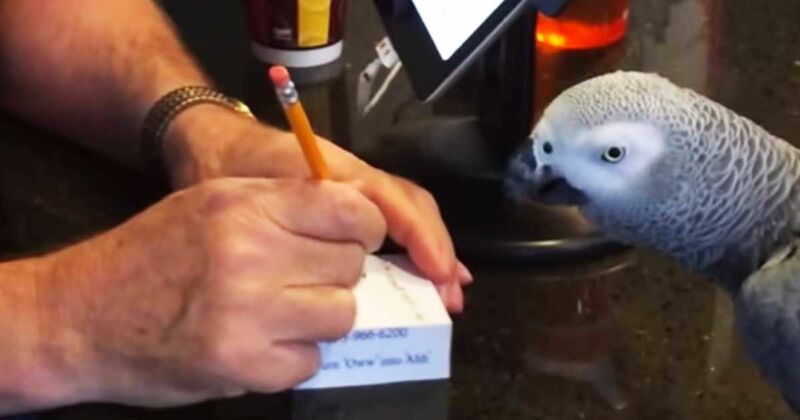 In the adorable clip, Stanley the bird goes right up to his human, who is writing with a pencil, and steals it from him! The pretty bird waddles across the kitchen island, with his owner calling out for him to give it back. Stanley isn't ready to give it up — and the owner only gets his pencil back when he can grab it from the cheeky bird. At one point, Stanley even makes a gargling noise at his owner, showing that he's annoyed his owner won't let him have the pencil. In the background of the video, you can see a big dog walk by, and eventually the family cat gets involved too. The owner asks the cat, Jet, to tell Stanley to cut it out. And, wouldn't you know it, the cat meows! The entire encounter is hilariously cute, so check out the video below. Stanley is just too funny, isn't he? Share this funny bird with your friends on Facebook, Twitter, and Pinterest.